← Revisiting our Favorite Concept! The iPad, the Galaxy, and many more—Tablets have officially become one of the most popular tech tools on the market. One of the best areas for using these useful tools? Higher education. Tablets are rapidly growing among students, and are proving themselves to be extremely effective in the context of education. So exactly why is it that these tools are so effective in higher ed? Think about it—tablets give everything students need on the go! From textbooks in e-book form to apps to help with organizing and studying to their Blackboard courses at their fingertips complete with class notes and annotation tools, these devices are truly priceless in higher ed. There are always new, innovative ways to utilize these tools being presented, so be sure to follow us regularly because we love sharing these ideas! With finals just ending, this infographic seems quite appropriate to share with you all! 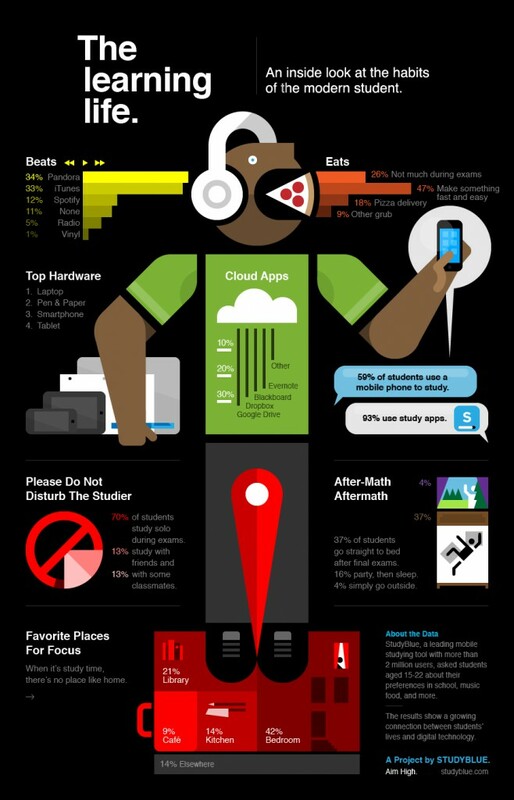 What are the study habits of the modern day student? From their beats to when they eat, check out the trends that students today are following! This entry was posted in Helpful Tips, Mobile Apps and tagged infographic, learning, Life, Tablets. Bookmark the permalink.